The word “recognition” (in various forms) appears eighty-one times in the text of William Gaddis’s ‘The Recognitions’. This information is captured in the wonderfully detailed ‘A Reader’s Guide to William Gaddis’s The Recognitions’ by Steven Moore – available to read online here. A great resource with detailed annotations on the text, synopses and links to a raft of material about the novel. I do not intend to add anything of substance to the various material that is already widely available about this neglected, underappreciated, challenging but important book, nothing more than to look at one other form of “recognition” …the mirror. Whilst I did not count the number of mirror references in the text (and I plan to do so upon a re-reading), I would estimate that it is more prevalent than the appearance of the word “recognition”. Gaddis’s first novel takes the form of a quest. In a carefully wrought and densely-woven series of plots involving upwards of fifty characters across three continents, we follow the adventures of Wyatt Gwyon, son of a clergyman who rejects the ministry in favor of the call of the artist. His quest is to make sense of contemporary reality, to find significance and some form of order in the world. Through the pursuit of art he hopes to find truth. His initial “failure” as an artist leads him not to copy but to paint in the style of the past masters, those who had found in their own time and in their own style the kind of order and beauty for which Wyatt is looking. His talent for forgery is exploited by a group of unscrupulous art critics and businessmen who hope to profit by passing his works off as original old masters. As the novel develops, these art forgeries become a profound metaphor for all kinds of other frauds, counterfeits and fakery: the aesthetic, scientific, religious, sexual and personal. Towards the end, Wyatt wrenches something authentic from what Eliot called “the immense panorama of futility and anarchy which is contemporary history.” The nature of his revelation, however is highly ambiguous and is hedged about by images of madness and hallucination, which disturbs simple distinctions between real and authentic, between faiths and fakes. Then she walked over to where to hinged mirrors stood against another wall, turned them open and closed them again quickly. –You . . . she said again looking back to the bed, for she’d turned quickly. There on the floor at her feet was a drawing, it was a meticulous self-portrait, and she took a step before she saw it, saw it was not a detail of brushwork that is, and leaned down to pick it up. –You. she said, –all upside down. Then she righted it and repeated, –all upside down. –did you bring your great Mirror? –Mirror . . . ? Close to 1,000 pages and not a single regret having encountered them. The paper used is recycled cotton and hemp and was fortunately sitting in a box at home as I’d purchased it for another project that is yet to be realised. The first three fictions are all part of an ongoing series of writing about writing and there is another piece in the series forthcoming from a different online publisher, so stay tuned. Hope you enjoy my ongoing exploration of the central Australian desert. Recently I have been posting a few thoughts about books from members of the Oulipo (“The Ouvroir de Littérature Potentielle”) and thought it relevant to repost my thoughts on the 2016 NLTA National Translation Awards for Poetry shortlisted ‘Minute-Operas’ by Frédéric Forte. Frédéric Forte was elected a member of the Oulipo in 2005, shortly after the publication of ‘Minute-Operas’, and two of his other works appear in the recently published ‘All That Is Evident Is Suspect- Readings from the Oulipo 1963-2018’, “99 Preparatory Notes to 99 Preparatory Notes” (tr. Daniel Levin Becker) and “The Pitch Drop Experiment” (tr. Ian Monk). By the way, the minute-operas are also 3 inches long in the original version, just by chance. Designing the form, I measured a Jacques Roubaud’s sonnet (in one of his Gallimard books) as a benchmark, and it was… 7,62 cm long, which appears to be 3 inches exactly! Very incredible when the work goes this way. Each poem is “Staged” on the page, where a “simple vertical line of 3 inches (I measured the line thinking it would more likely to be in centimetres, but inches it was, I wonder if this is part of the translation or a US audience too?) separates, what Forte calls the stage and the wings”. Reading more Oulipoen works I have revisited ‘Minute-Operas’ and am still amazed by the typographical delight and the stunning array of word games. If you are interested in the works of the Oulipo this is one to add to your collection – my mind hasn’t changed in 2 and a half years. 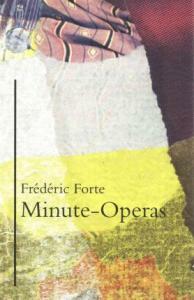 First up from the American Literary Translators Association, 2016 National Translation Awards longlist for Poetry (geez that’s a mouthful), is Minute-Operas by Frédéric Forte (Translated from the French by Daniel Levin Becker, Ian Monk, Michelle Noteboom & Jean-Jacques Poucel). Stepping into Frédéric Forte’s work is like stepping into a vast sparse gallery space, open space around you, take time to ponder what your eye has been drawn towards. Broken into two sections, “Phase one – January – October 2001” and “Phase two – February – December 2002”. Each section containing 55 “poems” or creations.